Shane Rhoades joined Buzard in 2007 and found his skills to be a solid foundation for the art and trade of organ building. A third-generation carpenter and cabinet maker, he is a proud graduate of the Mid-Central Illinois Regional Council of Carpenters Trade School. He also has college coursework in architecture and AutoCAD. He became a member of the American Institute of Organ Builders upon joining Buzard and has participated in building nine instruments since. A particularly satisfying accomplishment was the fabrication of the companion choral organ for Saint Mark’s the Evangelist Catholic Church in San Antonio, Texas. As Production Director and Chief Engineer Shane prepares engineering diagrams for the instruments, oversees the production schedule, and insures quality control. Further, his engineering responsibilities include the finished drawings of all design, structural and mechanical elements of our organs. 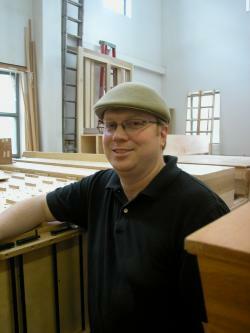 The combination of music and carpentry are a natural for Shane. He plays guitar, banjo and mandolin in local Irish music sessions and his work with Buzard has given him the pleasure of participating in Celtic music sessions across the country.